Speaking in weather terms (and since the rainy season is next here in Portland), our “in” boxes have been flooded with plum cake recipes lately. Even if we baked one of each recipe we read, we’d still have plenty of plums left over. 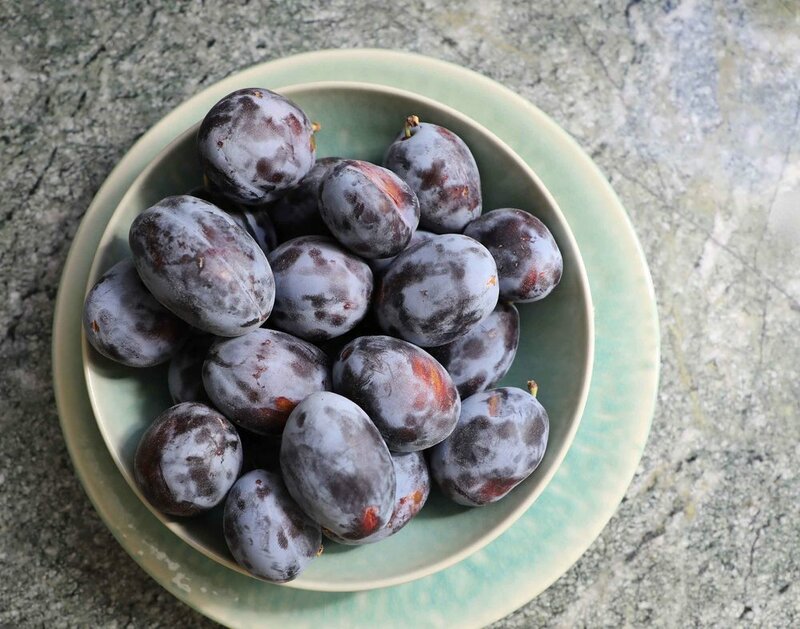 We developed this recipe to share with you that involves quickly cooking the plums down into a chunky compote as a way to use up more of our bounty. An added bayleaf and an optional splash of brandy balance out the flavor so it’s not cloyingly sweet. Layer this jammy compote to the top of our easy cake batter before baking. Some of the plums stay on the surface, others sink down, creating a rustic cake that makes a delicious weekday snack with a cup of tea. Brooks plums (a European variety that is prevalent in Oregon) are the ones pictured here and what we used for this recipe. They are larger than many other varieties. If you use a smaller variety, don’t hesitate to double the number of plums in our recipe. You might consider making extra and setting it aside to eat with ice cream or yogurt. Since school is back in swing in the Thread & Whisk homes, we are trying to start the year off right with a strong lunchbox game. You might say that we take product development seriously around our studio since we’ve been packing this dessert to go with our own lunches too. Preheat oven to 350 degrees. Butter and flour a 9” springform cake pan. Set aside. Combine plums, 1/2 cup sugar, bay leaf, water and brandy in a medium sauce pan. Cook over medium heat for 7-10 minutes until the mixture is still very chunky but coats the back of a spoon like - dare we say it - cough syrup. Stir occasionally while cooking. When done, remove from heat and allow to cool for at least 15 minutes. Remove bay leaf. Using an electric mixer, combine butter and 1-1/4 cups sugar. Beat until light and fluffy (3-5 minutes). Add eggs, one at a time, combining mixture in between. Add vanilla. Slowly add in flour mixture until just combined. Scrape contents of mixing bowl into springform pan. Smooth out top with an offset spatula. Add plum mixture to top. Bake for 35-40 minutes until cake has slightly pulled away from sides of pan and an inserted cake tester comes out without batter on it. Some of the plums will sink into the body of the cake. Allow to cool several minutes before removing from pan.